With two of his #MGA professors, senior psychology major Anthony Cleator has co-authored several scholarly articles that will be published in research journals. High School: "I graduated from Bedford High (Bedford, Mass. ), where I served as a peer tutor and as an intern assisting instructors of students with social, cognitive, and neurological challenges (LABBB Collaborative). I also attended Warner Robins High, where I participated in the math and psychology clubs." Family: Deborah Vredenburg† (mother), Christopher Vredenburg (stepfather), Michael Cleator (father), Angela Cleator (stepmother), Jessica Firestone (sister), Vanessa Cleator (sister), Kymberli Howell (sister), and Joey Cleator (brother). Degree Objective: Bachelor of Science in Psychology with a concentration in Leadership and Training/Business. Career Goals: "My next step is to earn a doctorate in the realm of cognitive psychology/behavioral neuroscience. After, I plan to continue my career as a professor and researcher of psychology, ideally specializing in cross-modal perception." He chose Middle Georgia State University because … "MGA is conveniently located and affordable. Several alumni I know have also given positive reviews of the University and faculty, mentioning such qualities as its diverse student body, professors who are invested in their students, and flexibility in course scheduling." The greatest thing he discovered about Middle Georgia State was … "Faculty genuinely care about students. I was told this before applying, but I did not understand the magnitude of this statement. Many of our instructors seem interested in cultivating greatness in students who show promise or express some passion in their career objectives. I often hear students talking about professors who have helped them find resources, internships, programs, or experience pertaining to their goals. I have been recruited to several projects and offered opportunities to present at undergraduate research conferences because of my interests in research and statistical analysis. It still amazes me to see professors going above and beyond to help prepare people for their futures, even using their own academic networks to benefit us. This occurs in tandem with our Student Success Center working tirelessly to aid students in reaching their goals. While this may be in the best interests of the University, it's been made abundantly clear that we are not just faceless names on a roster." 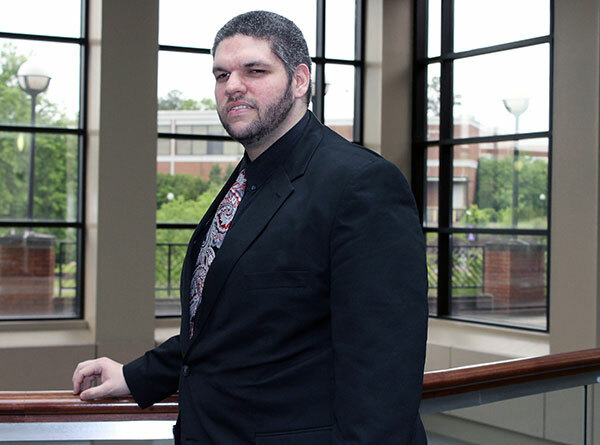 His greatest academic experience as a Middle Georgia State student has been … "It is difficult to choose, but I would say earning co-authorship on publications in scholarly journals would be my greatest and most challenging experience. Dr. Gladden has given me opportunities in scientific writing, collecting data from participants, and making methodological decisions. My experience with Dr. Hancock included lab work, data entry, and statistical analysis. Between both, I have coauthored an article accepted into 'EvoS Journal: The Journal of Evolutionary Studies Consortium,' an entry under review for the 'Encyclopedia of Evolutionary Psychological Science,' and an article in preparation for the 'Journal of the North Carolina Academy of Science.' These opportunities have helped me find confidence in myself and my abilities, have given me experience crucial for success, and have granted me certainty in my ultimate goal of becoming a researcher." To him, “greatness” means … "Meeting one's goals. It seems ridiculous to say that everyone should aim to be at the top of some ladder or pyramid or whatever metaphorical representation we feel like using for our social and organizational hierarchies. All rungs are necessary for these hierarchies to function, after all. Greatness, to me, means finding one's place wherever it may be, wherever one feels most content or personally fulfilled. Greatness shouldn't necessarily mean being a leader for those who feel they are best suited as followers. For myself, 'greatness' is trying new things, allowing myself to fail, learning from my mistakes, and eventually discovering where I belong, but there is no singular meaning tailored for everyone." In five years ... "I see myself working on my doctorate. Life takes us through unexpected detours and I know, for a little while, I will take an opportunity I was given to experience new cultures. There is no telling where this path will lead, but in the course of five years, I see myself making unexpected connections, creating a new home, and gaining a better understanding of the world around me. I can't say how far into a doctoral program I expect to be by then, but I feel growing as a person will help in that endeavor."